The sinking of the Titanic happened almost a hundred years ago (1912) and the story still fascinates the world. The tragedy was reported in newspapers everywhere. 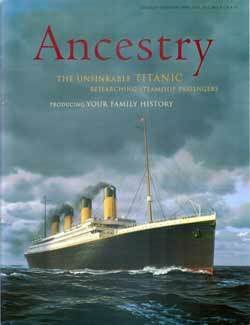 This article includes information about researching ancestors who were passengers on steamships. ©1995 from Titanic: An Illustrated History, a Hyperion/Madison Press book.